Today’s epistle shows us the early life of the Church. The believers meet ‘by common consent in the Portico of Solomon’. The Christians pray in the Temple to show their relationship to the faith of all other Jews. Although group pressure kept the majority away, they recognized the qualities of the Christians. Then the high priest supported by the Saducees had the apostles imprisoned. The Saducees opposed the Pharisees. The Saducees who were Hellenizers did not hold with religious strictness. They accepted the written Law only. They did not believe in the resurrection of the body; or in angels and spirits. The Pharisees did believe in all that. We are told that an angel, or messenger – aggelos - releases the apostles and sends them to bear witness. We may suppose that a sympathetic messenger, a devout Jew, has arranged for the apostles to be released; for later in the same chapter (5: 34-40) Gamaliel who is a Pharisee and a doctor of the Law advises the Sanhedrin – the supreme court - to give the apostles the freedom to preach, so that it may be discovered whether their faith is ‘of human origin’. They took an analytical view to determine whether Jesus was all that the apostles claimed for him. What had happened with Jesus must happen with us. The power of the Holy Spirit is then given to the disciples by Jesus, who has received from the Father his glory: the glory of having conquered death. By breathing on the disciples, by giving them the direct power of life, he gives them the power to give life to others. The same word for ‘breathe’ in the beginning of the Bible (Gen 2: 7) is used here. John is making the new creation of life in Christ an image of the power of God at the beginning of time. On the last night with the disciples, Jesus had promised them peace, joy and the authority to represent him. The reading from Acts shows these things taking effect. And the conquest of faith is to overcome sin. the Word is made flesh. Jesus is God. This is for each of us to discover in the power of the Holy Spirit. Confronted with that choice, Thomas proves that seeing is believing. That will to disbelieve, that refusal to believe, is now governed by a direct response from his heart. Jesus says: ‘You believe because you can see me. Happy are those who have not seen and yet believe.’ And that is where our will must be asserted positively. We stand in Thomas’ shoes, make his great confession of faith, ‘My Lord and my God!’ and then go on our way to martyrdom with the other disciples, knowing the way, the truth, the life. John ends by telling us that there were many other deeds of Jesus after his resurrection, but that ‘these are recorded so that you may believe that Jesus is the Christ, the Son of God, and that believing this you may have life through his name.’ It is through such events that Peter proved what he had declared ‘You are the Christ… the Son of the living God’ (Matt: 16, 16). 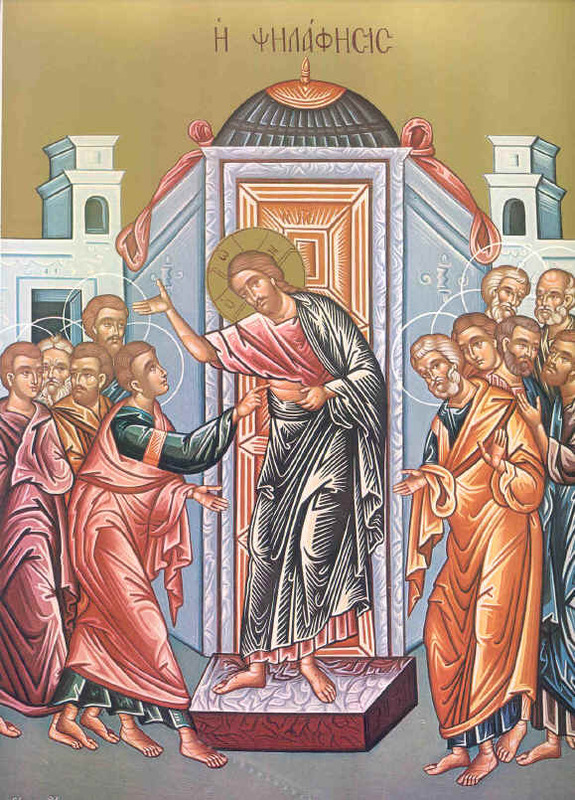 And Thomas who had seen Lazarus raised and who before that was willing to go to ‘die with him’ (John 11: 16) is now able to die for the truth of this great fact. The tradition is that Thomas died for the faith in Madras, South India, with a spear thrust in his side, like his Master. This is what all the martyrs have died to proclaim. This remains our Orthodox faith. That is our joy and our peace. Christos anesti ek nekron, thanato thanaton patisas, kai tois en tois mnimasoi, zoin charisamenos.